A relationship between a Pisces man and a Libra woman is like listening to a magnificent orchestra. If the chords are worked right, there is nothing more stable and harmonious. These are two tender souls who will bring out the best in each other. The Pisces man will definitely be attracted by the intellect and charm of the Libra woman. Her ideas and strong sense of logic is definitely a turn on for the Pisces man. Very similar to a Piscean trait, the Libra woman’s mind dwells into imagination and dreams. She is however more grounded and practical. Her compassion will enhance this quality and lure the Pisces man into her web of dreams. On the other hand, the Piscean man should be aware that his trait of looking deep into someone’s soul and figuring out what they are made of may not fully work with a Libran woman. Her intellect and calculative nature will make it harder for the Pisces man to probe into her mind. It will be a tough nut to crack. Romance can be at its peak with these signs. Both can be dreamy at times and classic moments like watching the sunset, or a cool yet sunny day in the park will be ideal for this pair. The Libra woman is strongly attracted to partnership and times like these will enhance the feeling of togetherness. She will also enjoy feeding off the fantasies and imagination of the Pisces man and become fonder of this mysterious, yet gentle and caring creature. The Pisces man is a good listener. This is a strong virtue to posses while in a relationship with a Libra woman. When there is a problem in the relationship, the Libra woman will use her intellect and maybe even try to solve an emotional issue by putting together blocks of logic. The Pisces man on the other hand will first lean towards his feelings to try and decide what is the most appropriate outcome which in no way, is emotionally hurting. Although conflicting at times, being a good listener and no stranger to sacrifice, he will address the problem by taking the first step towards compromise and heed the factual advice of the Libra woman. It is very important for both partners in this case to remember not to push the limits of their wonderfully aligned abilities. Frustration will lead to depression in case of the Pisces man, and sometimes anger or urge to be dominant in the Libra woman. Love relationship between a Pisces man and a Libra woman can be very powerful. This is because both will be lured into the other’s imagination and fantasies. The mystery of not figuring out what the partner desires will make times spent in the bedroom extremely exciting, and creative. Trust and faith are two very important elements which can strain the sexual relations of these two signs. If there is an issue, the two may over think the problem which will have an immediate impact on how they behave in the bedroom. If these two elements are under control, moments like a simple conversation on the balcony along with a glass of wine may end up in a steamy session on the bar or on the kitchen bench. 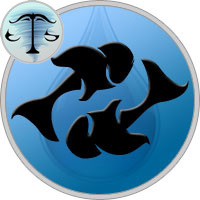 The Pisces man will need to make an effort in his day to day life to be organized and remove any form of slack. The Libra woman will surely get pleasure from knowing that her partner is of a stable nature, yet very creative. His quest for enlightenment will surely be a turn on for the Libra woman. It is safe to assume that the Libra woman will need her space and time to let her mind feed on knowledge and intellect, which may be in form of papers, articles, art or music. This is a bonus for the Pisces man who definitely requires moments of solace to catch up on his own learning. It is a win-win situation for both.